The Diocese of Wollongong’s bi-yearly publication, Journey Magazine, has taken out the top gong at the 2018 Australasian Catholic Press Association Awards. The Bishop Philip Kennedy Memorial Trophy is awarded to the publication that wins either one of three awards: Best Newspaper, Best Magazine or Best Online Publication. Journey Magazine was awarded Best Magazine after judges noted it for being stand out in terms of presentation, style, layout and content. 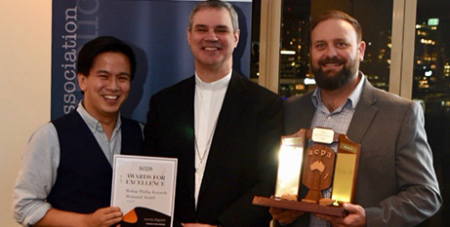 The awards were held on Wednesday 5 September at the Rydges South Bank, Brisbane South, in conjunction with the 2018 Australian Catholic Communications Congress. Melbourne Archbishop Peter A. Comensoli and Brisbane Emeritus Bishop Joseph Oudemann presented awards to the recipients. Outgoing ACPA President Jenny Brinkworth said the awards are a great celebration of the dedication and faith-filled commitment of professionals from across Australia. “There is an amazing amount of talent and passion among our Catholic press and it really is pleasing to see the enthusiasm of those who entered,” Ms Brinkworth said. “I take this opportunity to also thank all the judges and ACPA Committee members for once again coming together to help make this great event take place,” she said. Judges’ comments for the Bishop Philip Kennedy Award noted that Journey Magazine is an excellent example of what can be achieved, covering both local news, feature articles and issues. “It is immediately impressive in its cover pages and the layout is both simple and elegant, a very sophisticated combination,” the judges noted. Other award winners included the Australian Catholic Bishops Conference daily e-news service CathNews as Best Online Publication, and the Archdiocese of Adelaide’s monthly newspaper, The Southern Cross, as Best Print Newspaper. As part of the awards ceremony, ACPA Life Memberships were awarded to Crossroads editor and parish priest of Ballajura, Western Australia Fr John Jegorow, and former editor of Paramatta’s Catholic Outlook, Jane Favotto.